They have found that instead of using a single gene to control pigment production, corals use multiple copies of the same gene. 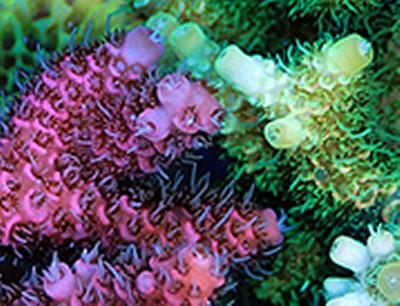 Depending on how many genes are active, the corals will become more or less colourful. The research, which is published in Molecular Ecology, also explained how this strategy could help corals to survive in stressful environments. Using the staghorn coral Acropora millepora as a model, the team found that the fluorescent pigments that are mostly responsible for coral colours act as sunscreens for the symbiotic algae that live in the coral tissue. These alga require light to produce sugars, which they can contribute to the nutrition of the corals in return for the shelter and the supply of nutrients that are provided by the coral host. However, the light intensities on coral reefs can, on occasions, exceed the levels that are healthy for the alga and the light becomes dangerous for the symbiotic partnership. This light stress can ultimately contribute to the loss of the symbiotic algae, a process known as coral bleaching. If the partnership cannot be re-established, the corals often die. However, the enhanced protection comes at a cost and the corals need to allocate substantial energy reserves to accumulate the high amounts of protein pigments that are characteristically found in brightly coloured corals. This energy might be divided away from other important processes, potentially resulting in reduced growth rates or lower numbers of offspring. Therefore, being brightly colour might not be a good investment for corals settling in less light exposed parts of the reefs. Dr Wiedenmann says: “The genetic framework provided by gene copy number variation ensures that some individuals within a coral population can protect themselves very well, these are likely to survive better in stressful environments. Others are less protected, but can invest their energy in processes that could help them to succeed in habitats with less light stress. The resulting colour polymorphism increases the potential of the coral species to extend their distribution range along the steep light gradients of coral reefs and to inhabit more ecological niches. For the study, researchers from the University of Southampton worked together with colleagues from the University of New South Wales in Australia and the University of Ulm in Germany. D'Angelo, C., E.G. Smith, F. Oswald, J. Burt, D. Tchernov and J. Wiedenmann. "Locally Accelerated Growth Is Part of the Innate Immune Response and Repair Mechanisms in Reef-Building Corals as Detected by Green Fluorescent Protein (Gfp)-Like Pigments." Coral Reefs 31, no. 4 (2012): 1045-1056. D’Angelo, C., A. Denzel, A. Vogt, M. V. Matz, F. Oswald, A. Salih, G. U. Nienhaus and J. Wiedenmann. "Blue Light Regulation of Host Pigment in Reef-Building Corals." Marine Ecology Progress Series 364, (2008): 97-106.